Trends in recruitment change — very often. 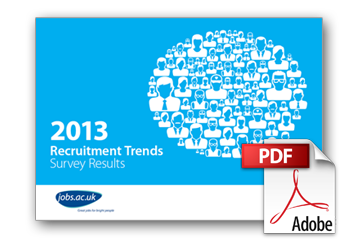 To ensure we stay in the know, last month jobs.ac.uk conducted an online recruitment survey to better understand recruitment trends across the academic, research, science and related sectors. The research was also designed to provide recruitment professionals with useful benchmarking information to help make more informed recruitment decisions, such as identifying the most effective candidate-attraction methods. In April, we asked 172 organisations that are engaged in recruiting academic, research, science and related staff, for their thoughts and feedback on the recruitment landscape and the results are now in! Commenting on the findings, Carl Freelove, Marketing Manager at jobs.ac.uk, said “The numbers in the survey clearly demonstrate that job boards, particularly, specialist job boards, are still an important part of the recruitment mix. The research also indicated that a lack of skilled or quality candidates was the biggest challenge for recruiters, which is supported by the majority of respondents using specialist job boards, such as jobs.ac.uk, to find more relevant, better quality jobseekers.